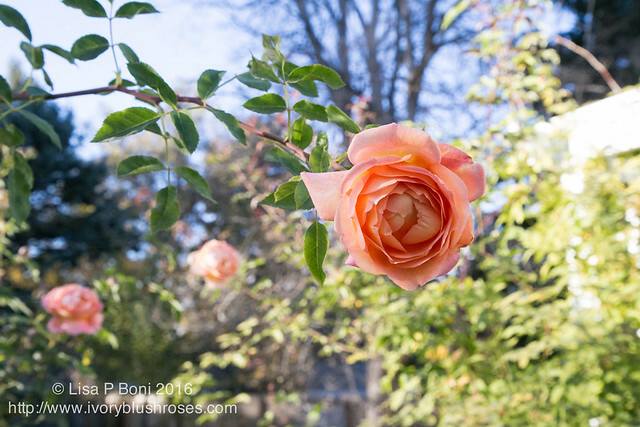 What a treat to be able to pick roses into mid-November! 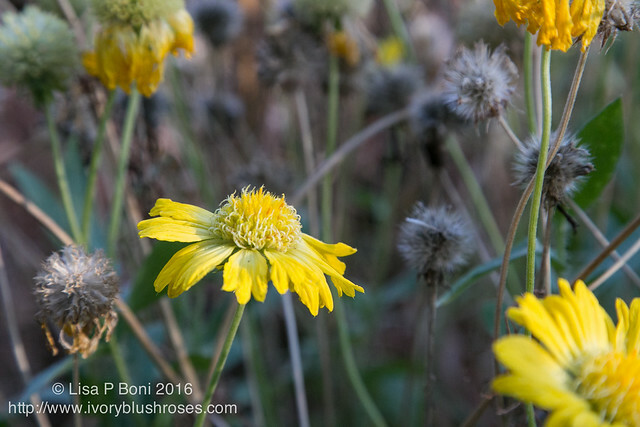 Not just a blossom or two, but a lovely large bouquet of them! 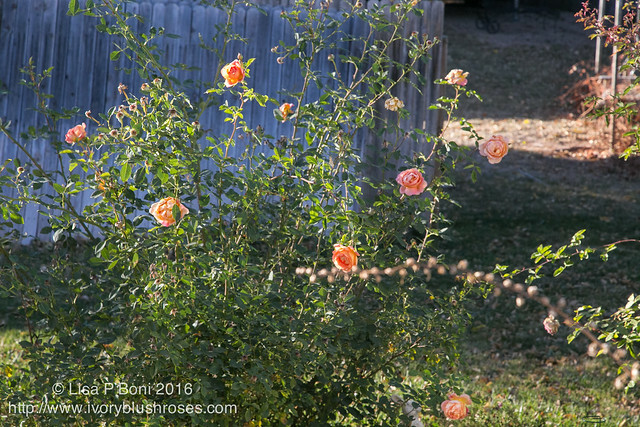 Last year, the roses made it into the first week of November, but this year, without a hard freeze yet, they have continued to blossom through today. With our first hard freeze and snow expected tonight, I opted to bring these beauties inside to enjoy for a few more days. Had I not turned the water off back in mid October, I'm sure there would be even more blossoms! 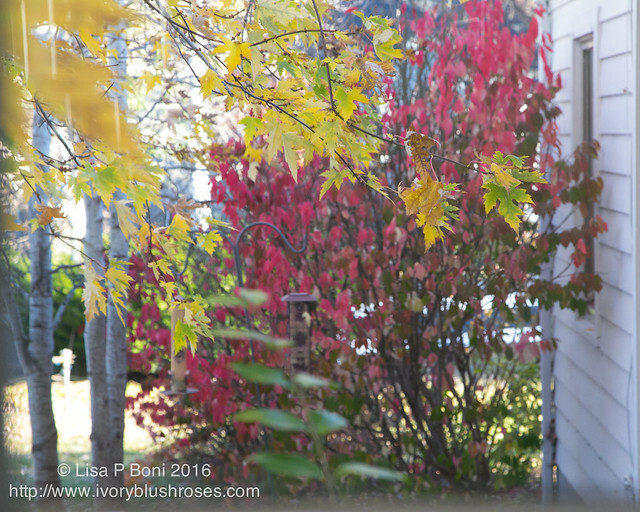 The last of the leaves are changing and falling. Spectacular colors! Son Zach helped me bag up the huge mound of leaves that I had raked up. There will be more, but the bulk of the job is done. 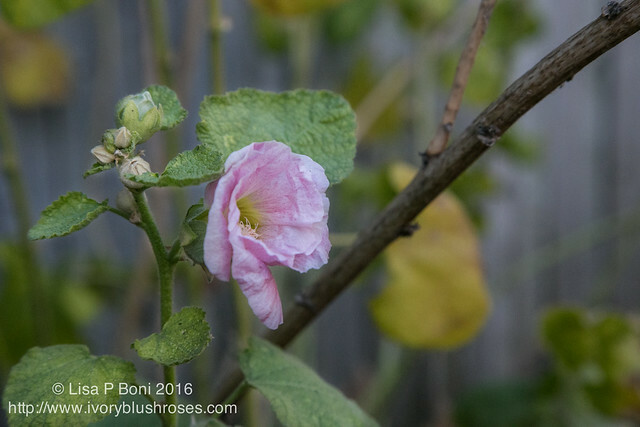 As I looked through other parts of the garden, I was amazed to see Hollyhocks still blooming! I've never had them last beyond September before! 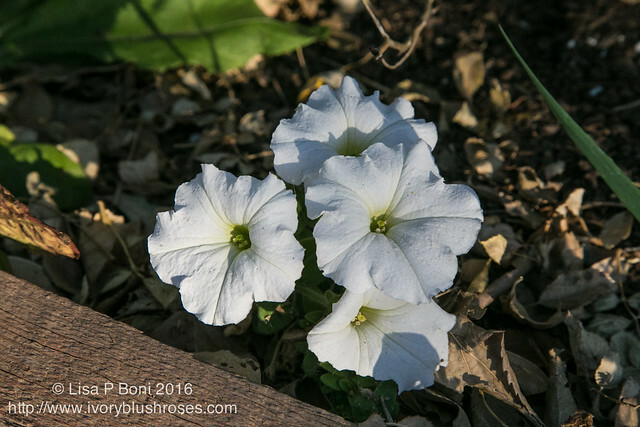 as well as a last few petunias. 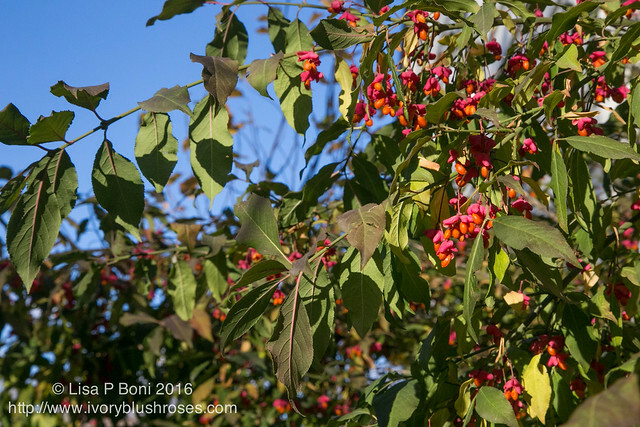 The berries on the Spindle bush still hang in a glorious riot of color! Such abundance of them this year! 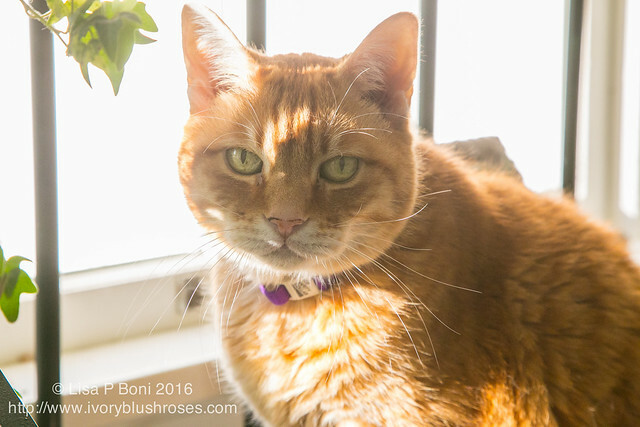 Thomas enjoying the autumn sunshine through the window. I've spent my days off this week finishing up our family cookbook and taking a few last photos for it. So good to have this huge project complete at last! One of my projects for this coming year is to resize some of those loved recipes into smaller amounts more appropriate for one person. I so rarely cook for 6 or more, and thats what most of our recipes were for. For me, that is enough food for two weeks since one portion usually equals two for me! In the past I've tried freezing the extras, but I learned that once it goes into the freezer, it tends to stay there until it is past its prime and ends up getting discarded. 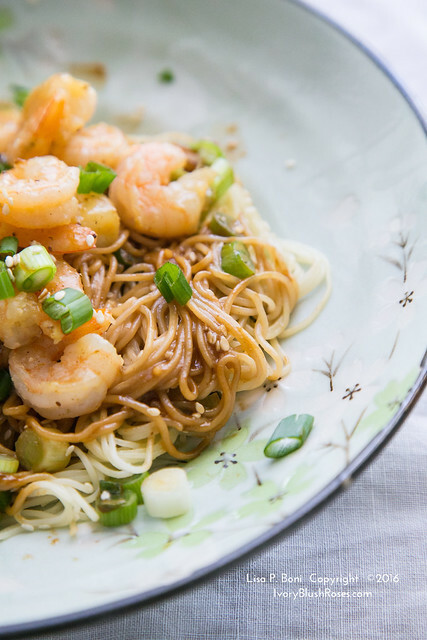 These Sesame Noodles were my first go at resizing a recipe. It made two "me" sized portions, which is about how long I like to eat leftovers! Perfect! I've had a wee bit of time to get into the stitching studio this week as well. Working on finishing up some projects, so nothing new to share at this point. But I've loved the view out into the garden from where I sit. 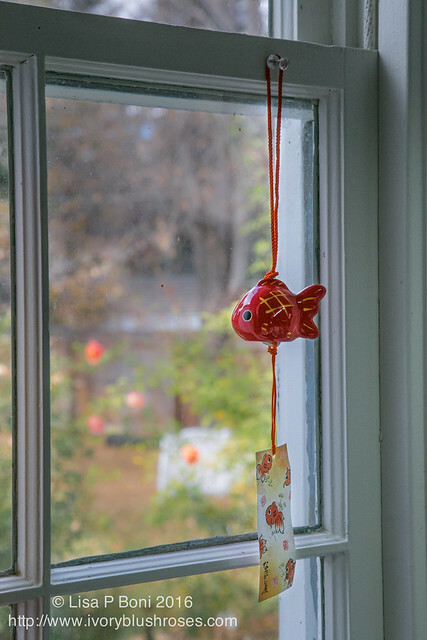 The only souvenir that I brought home from my trip to California was this little Goldfish Chime from the gift shop at the Japanese Garden. 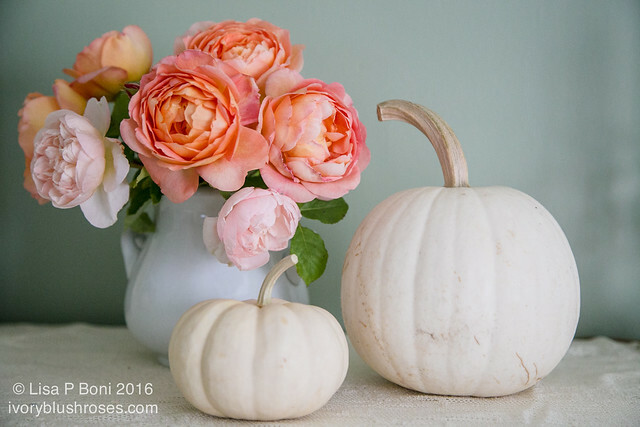 So sweet and a perfect complement to the roses blooming outside in the garden. So lovely, as always. Blessings to you, dear friend! HI, Lisa! Our cold weather hasn't arrived here either; our high today was in the 80s. Your roses are wonderful! Right now, I only have a few marigolds still holding on but hope to get pansies out soon. So happy to hear that you're getting some stitching done! I'm doing some home dec sewing for housewarming gifts for a friend with a new home but looking forward to getting back to a small, almost-finished crazy wall hanging. Thomas has the sweetest face! Wishing you love and blessings! 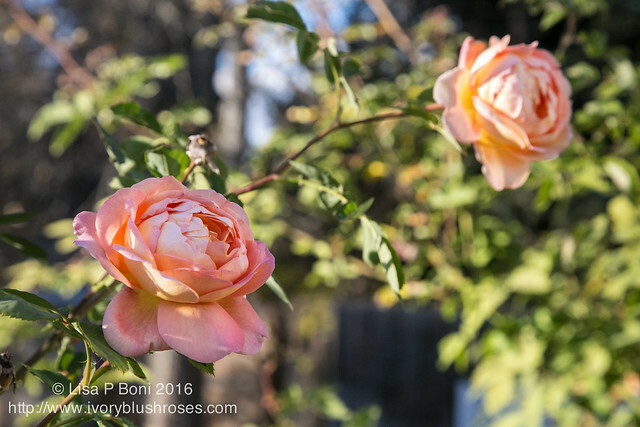 How beautiful your roses are and how wonderful to have this bouquet so late in the year. I love the verse you ended your post with.